The “Trail of Tears” – the forced relocation of Native Americans from the eastern United States to what is now Oklahoma – will forever be a stain on our nation’s history. But one positive impact came from the Indian Removal Act of 1830: When natives of the North American continent moved westward, they brought with them Christian beliefs. In fact, they brought with them Wesleyan theology in what was at the time the fast-growing Methodist tradition. Not too many years later – 1844, to be exact – the General Conference of the then-Methodist Episcopal Church created the Indian Mission to serve native people who had been transplanted in the central part of the United States. Editor's Note: This is the first in a three-part series on cross-cultural mission partnerships being supported by the Great Plains Conference in the South Central Jurisdiction and around the world. This installment focuses on the Oklahoma Indian Missionary Conference. Today, that tradition of blending the rich Native American culture with Wesleyan theology continues with the Oklahoma Indian Missionary Conference (OIMC). The vast majority of congregations are located in Oklahoma, but worshippers also gather throughout Kansas and parts of Texas and Missouri. Those seeds have blossomed in many ways, with the OIMC now serving as home to more than 6,000 members in 84 churches. The Rev. Patrick Freeman served in the OIMC as well as churches in Kansas prior to retiring as a United Methodist pastor. He credits the ministry and service he both witnessed and took part in as key parts of his own foundation as a pastor. He said it’s important for people to understand the history of the OIMC and its reach to native people in Oklahoma and beyond. The Rev. David Wilson, superintendent of the OIMC, said the assistance from the Great Plains is appreciated because of the need to raise salaries in his conference. The OIMC provides a base salary that is dependent on a pastor’s education. “For instance, a pastor with a master’s of divinity degree will start out making “$27,800,” Wilson said. “That’s the base salary. It doesn’t mean you have the opportunity to go to a larger church that pays a larger salary because it doesn’t exist. If you think about that salary, it puts many of our pastors right at the poverty level. One way the OIMC tried this year to maintain and actually bolster salaries was to conduct a gala in October in Oklahoma City. 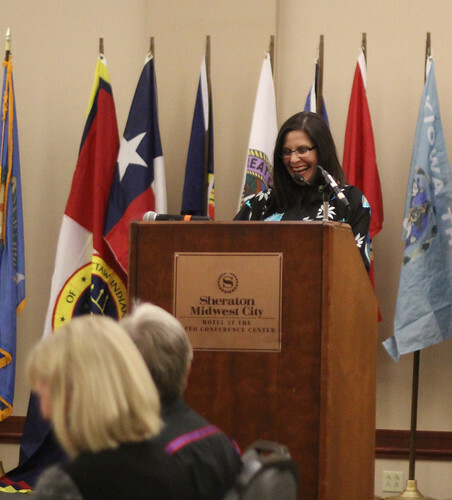 The event featured a silent auction and dinner, the expense of which was donated by the Chickasaw Nation, with all of the proceeds going to the OIMC salary endowment. With some money still coming in, Wilson reported in mid-November that the gala raised about $85,000 for the endowment, a $14,000 improvement over the previous gala. The Great Plains Conference, which sent a contingent of approximately 10 people to the event to show support, received recognition during the gala. In particular, a gift was presented to Copeland United Methodist Church from the Dodge City District. This church, with attendance of approximately 24 per week, made a donation of $10,000 to the Great Plains Conference’s fund-raising drive to help the pastors’ salary endowment. Penney Schwab, a member of the church, said a special gift to the church helped make the size of the donation possible. Because some of the church’s members are Chickasaw and because Copeland United Methodist Church’s members understand the difficulties that small churches often face, the church’s Missions Committee voted to make what is meant to be a “kick-off” gift for the fund-raising campaign. "It was wonderful to be part of such a culturally rich event to raise money for pastors who are doing the work that God is blessing,” said Courtney Fowler, Great Plains Conference lay leader and a member of the delegation that attended the gala. “I'm so proud of the Mission Committee at Copeland United Methodist Church. They are truly an example that size is not a barrier to mission, and they gave generously for a cause they believed in." Bishop Hayes spoke attendees at the gala and expressed his optimism for the future of the OIMC. “This is not about us trying to be separate or distinct. It’s about us being in union together with one another, trying to accomplish the goal of making disciples of Jesus Christ,” he said. He continued to express his hope that the OIMC would remain a leader in the effort to spread the gospel of Christ to Native Americans while preserving their culture. "I believe that OIMC will raise up a new nation of gifted, qualified leaders that will change the course of how ministry is done among native people," Bishop Hayes said. "I believe that OIMC will be a leader in re-establishing native languages among its people and tribes. I believe that in our lifetime, the support of our pastors will be competitive and fundamentally sound so that we can attract younger and gifted pastors." Learn more about the fund-raising efforts for these cross-cultural capital campaigns.